This year I ran for Florida House of Representatives District 49 (Orlando). I lost, but I got 31% of the vote and I only spent $3000. My opponent got 69% of the vote and spent $100,000. I’ve been asked about this on Reddit, so I’m going to make a detailed post about how to run for Florida House of Representatives. This is for state level offices (Florida House of Representatives and Senate). The local offices (soil and water, county commission, property appraiser, sheriff, supervisor of elections, etc) use different forms and have different reporting systems, as does the Federal level. All Florida candidates documents are public record. You can see every document and correspondence between the State and the Candidate at http://dos.elections.myflorida.com/candidates/CanList.asp. 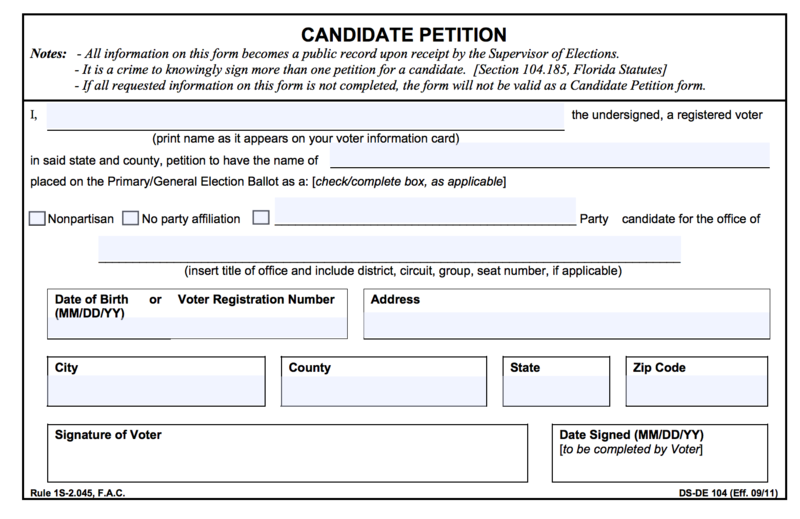 The first form is the DS-DE 84 – Statement of Candidate. This form just states your name and what you are running for. The second form, DS-DE 9, is your campaign treasurer form. This can be yourself. You can also fill out this form multiple times with other people as your deputy treasurers. This form must be done before opening up a bank account! Once the state receives these forms, you will get an acknowledgment packet in the mail. You can now open a bank account and start taking contributions and making expenditures. There are two methods to qualify: Pay the qualifying fee, which was a little over $1000 (It is a percentage of the yearly salary of the seat you are running for), OR qualify via the petition method, which means getting people to sign a petition to have you on the ballot. This form is DS-DE 104. For my district, this was 976 signatures. I filed about a month before qualifying documents were due. I did not get 976 signatures. I had to pay the qualifying fee. I found out later that my opponent had turned in his candidate documents almost a year before I had, and had been working on these petition signatures for a long time. The earlier you start the better. He was able to qualify with the petition method. As a side note, these signatures are given to your local elections supervisor, and get verified. 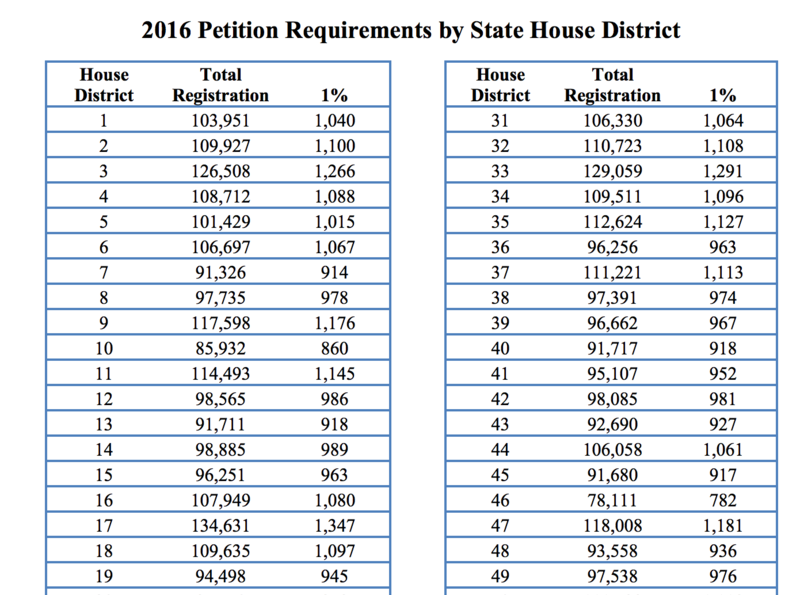 You have to pay ~10cents per signature, and they will be thrown out if they aren’t a registered voter in your district. During the week of the qualifying period (the period where you can turn in your petition signatures), you will also have to file your Financial Disclosure Form 2015 CE Form 6. This form is hard to fill out, but not impossible. You basically have to fill out what you make at your job, how much you have in your bank accounts, what debt you have, and what assets you have. You are on the ballot! You are now running. If you are running on a party, you may have to go through a primary. As an NPA (No Party Affiliation) I was on the November ballot. Now you get to run. You will need to setup a website, a donation system, start doing outreach, setup your Facebook and twitter pages, etc etc etc. Any donation over $100 has to have the persons occupation and employer. Donations are limited to $1000 per person. Software is available to help with this. I built my own open source software: https://github.com/SheaSilverman . ActBlue is only for democrats. NationBuilder is available but charges per month. You will get LOTS of questionnaires in the mail and through email. Mostly to see if they want to endorse you. Be prepared to spend money on tables at Hob Nobs. These were fun, tiring, and introduced me to a lot of people in the community and to the other candidates. At every Hob Nob they held a straw poll, which allowed you to vote and they would release the results at the end of the night. That really helped with gauging my polling with various groups. Each Hob Nob was hosted by different groups like schools, chambers of commerce, and professions. They are worth every penny. I didn’t have much money, but I spent $200 on 100 yard signs. Get the biggest you can afford. They will be stolen. Factor that in. I also spent about $150 on Facebook ads. Totally worth it! This got me in front of about 5000 – 10000 people. You can super target your district. My opponent spent $100 a week on Facebook ads. I should have spent more. Send out press releases about every event to local media. You will start to make friends with the local press. I had 2 journalists at each of my events doing coverage. Make yourself available to them and treat them well. This is all I can think of at the moment. There was so much more. Please feel free to ask / comment / email me anymore questions you have! This entry was posted in politics and tagged florida, for, office, politics, running, running for office by SSilver2k2. Bookmark the permalink. This is exactly what I wanted to read. In 4-8 years I may run for office too. I voted for you. Thank you. Thank you for sharing your experience in Florida so openly. I’ve considered entering the arena myself in Pennsylvania and this gives me much greater confidence in how successful you can be, even as NPA. I live in Florida and was discussing this exact thing with a friend. Thank you so much for such a detailed post! For those interested in running for office in your area, https://www.runforoffice.org is a great resource to find open positions and get you started. I’m not affiliated with them, just think they’re a great cause. Thank you a comprehensive article very readily absorbed. A lot of them emailed me or sent me postcards asking me to buy tables at their event. I ended up searching Facebook for HobNobs in my area.